My ph dropped from 8.4 to 7.8. My ammonia is darker than the highest reading which is an 8.0!!!!!!!!!!!!! 8O My Nitrates are at 2.0 (which I know can get that high during a cycle), and my Nitrates are at 20 (which is also O.K. during cycle time). But ammonia at 8.0 !!!!!!!!!! Good Freakin Lordy!!!! Is this normal for SW????!!!!! I've been keeping FW for several years and never experienced anything quite like this. Is it ok if I do a pwc this early in the cycle? With my FW, I just let them cycle out and usually don't do a pwc for a couple weeks. But I've never seen anything like this and I am completely freaking out. I use a DI unit. However, initially I use declorinated tap water to fill the tank, cuz I know the water parameters are going to go out of control anyway; so I figure for the first fill up it doesn't matter if there's ammonia or nitrites etc.... Could this be a reason why my levels are out of control? Also, the LR I purchased was not cured. My LFS got in a shipment and I was there while they were unpacking it. I got first dibs (sweet). He told me because I have nothing in the tank, it would be ok to go with uncured. He told me to just give it a few SW dips in a bucket and throw it in there and let it cycle out..... Could this be the reason???? One more factor...... I saw a piece of rock in the curing tank that did not look like any of the other LR. It looked like a hard coral that turned to stone. (dark brown stone) I asked him what it was. He did not look at it, but when I described it to him he said it was probably a hard coral that died that he cleaned off and threw in the tank. It looked ideal for my seahorses to wrap their tails on, so I bought it along with the other LR. It's been in my tank since the 26th.....Could this be the reason. Oh, and I've been keeping a normal lighting schedule of 10 hours a day. I've been reading up on SW for quite some time, but there was nothing in the manual about this happening. So...if you have any idea what is really goin on in my encased SW wonder, PLEASE let me know. In a nutshell: You are curing the rock right now. You had nothing in the tank correct? (Seahorse?) That's why the LFS told you not to worry about it. LR has a major die off period when it's shipped. Once plopped back into SW it spikes the Ammonia and the nature cycle follows shortly after. Depending on your tank size your stats are going to be really high for a while. I didn't see mention of your tank size, but recall seeing a small 20 or 30 gal pic of your tank online. If you PWC you will cut the cycle down a little, but that's not a big deal at this point. You bacteria should be happy. Keep an eye on it, and change like you normally would. DON'T put anything LIVE into the tank until you have completed the cycle(s) and several PWC's. Not to mention your stats are where they should be. 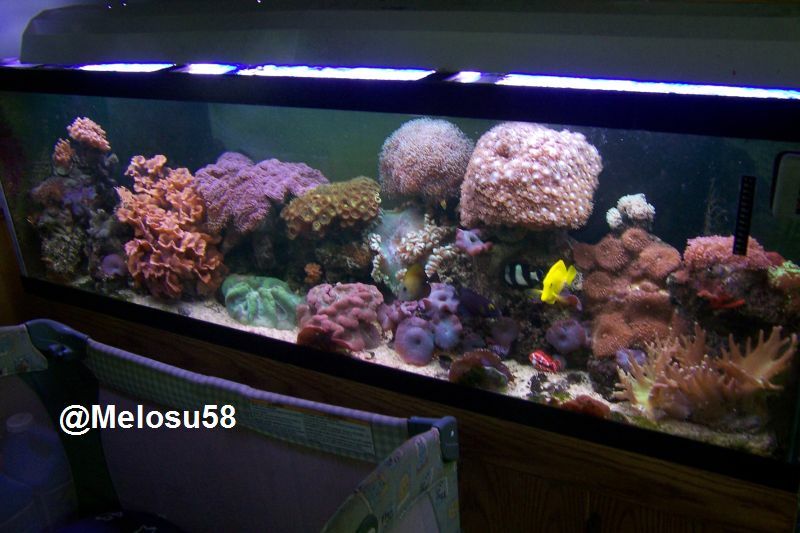 75gal Salt, 18gal Sump, Skimmer, 60lb Live Rock, 90lb Live Sand, 3 Pwrhd, 2x55w Actinic, 2x55w 10k. Guest list: Goby Green Clown, Percula Clown and entire clean up crew. Re: HELP! Completely FREAKING out!!!!!!!! I agree with the others, you are just having a happy cycle. The pH will naturally drop during your cycle as well, so I woudln't even worry about testing it for now. Even if it is left at 7.8, that isn't out of normal range. Just be patient now and let the cycle run it's course. I also agree, I wouldn't worry about a water change unless you want to for practice (or something like that). No need to. Ahhhh relief... Thanx so much guys! And no my tank was not cycled before I stuck the rock in there, so this is the initial cycle. I tested all the parameters as soon as I filled it because...#1 I was anxous to do SOMETHING with it...lol and #2 because I wanted to familiarize myself with the SW and reef test kits. I tested it again yesterday because my LFS guy told me that snails will help eat up all the crap on the LR. So, I wanted to see where my cycle was at. It is a 20 gal high. I was told to go smaller for the seahorses. I was going to go with a 29, but the initial cost would have been twice as much. I wish I would've went bigger, so the parameters would be easier to maintain. But I was also concerned about weight. The tank is in my bedroom next to an antique dresser that stands 5 foot high and weighs in at close to 200 lbs, if not more. There's also a 29 gal FW set-up in there. So, combined weight in my little bedroom is at least 600 lbs without the SW tank, the bed or any of the nightstands etc... To go with a 29 would have doubled the weight of the 20 gal, so I just stuck with that. I'll just have to watch it closely and do more pwcs. That's no big deal, cuz I'm constantly making DI water for my FW tanks anyway (as I have 6 of those running, including a Discus tank which requires alot of pwcs). Down the line (after much more research and reading), I plan on sticking a couple of soft corals in there. I was thinking of getting the powder 8.2 ph stabalizer. I hate using additives, but with it being a small tank, I'm fearful the pH will fluctuate and stress my ponies and eventually corals. Even if it is left at 7.8, that isn't out of normal range. If it stays at a 7.8 will this be ok for my livestock?? I plan on doing the pwcs by adding OSMO prep to my DI, then mixing in the salt. Once I figure out how much of what to add, the amounts will be consistent. I will NOT be adding the seahorses until I know exactly what I'm doing, and monitor water conditions for awhile to observe fluctuations. Soooooo powder pH stabalizer or not? The other question at hand......Do I do pwcs the same way I do for FW? By that I mean, Can I use a "gravel vaccum"? Do I twist it into the sand the same way I would with the gravel in a FW? And should I buy a seperate vaccum to use solely for my SW system? Thanx again for putting my mind at ease as far as the severe ammonia spike. I'll be heading down to That Fish Place in Lancaster today for supplies (I only live a half hour away). I plan on getting another gravel vaccum for my SW tank, but I wanted to double check first. With a proper alkalinity and water changes, this won't be needed. Alkalinity plays a big part in keeping pH stable and, I'd say 90% of the time, alkalinity, pH, and calcium are already just fine with freshly mixed saltwater. Unless you are having issues keeping the pH above 7.8 I would NOT add the buffer. It's not needed...and as it stops working, which it will over time, the pH is going to flucuate more. Stable is better, in this case, even if it is a little low. I am not a seahorse expert, but don't see why they would require a higher pH than other marine life. I use the same one with no problems. The only thing I'd worry about is if you have ever used a copper medication in your fw tank or plan on using any in the future, I'd get a different vaccum. Copper is lethal to sw inverts. I vaccum my sandbed lightly, avoid pushing the vaccum all the way down. That Fish Place is awesome. I live about...2 hours south I'm guessing but have been there once and it was worth the drive. I agree that with frequent PWC`s you dont need those additives. PWC`s will do all you need for trace elements, buffering and calcium needs. As far as the sand I have never vacuumed mine in the 9+ years that I`ve had a tank. I just allow my clean up crew to take care of that. I have a bullet goby that turns my sand every other day. Ditto on not doing any sand vacuuming. Let my clean up crew and star fish turn up the sand for me. You do not need additives unless you eventually plan on keeping a tank full of SPS corals as I do. Eventually the tank and PWC's can not keep up with the calcium demand and you must dose. Animals such as clams need a lot of calcium. However, in the early stages and if you will be keeping lower demanding corals regualr PWC's preferably weekly should be ok. I have the reef test kit to monitor all that other stuff, so I'm good there. I never add copper based meds to the tank. I prefer the natural stuff (melafix and pimafix) for my FW tanks. I bought Reef advantage calcium to add when my calcium levels get low. And I completely agree with u Devilishturtles, stable is better. I bought another gravel vaccum while I was in Lancaster. They told me not to stick it in the sand, to just go over it.